Are you spending hours working out every week, and not getting the results you want? Chances are you might have a bad habit or two when it comes to exercising. Never fear, there’s a quick fix for even the most ingrained workout no-nos. Check out these 7 workout habits you should drop: Not only will ditching these help you lose the pounds, they will help you become a more efficient exerciser. 1) The elliptical. I’m not a fan of the elliptical. Not only is it the most boring piece of equipment in the gym, it is also extremely ineffective. 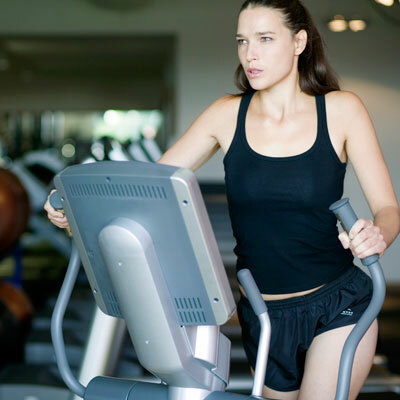 First off, the elliptical doesn’t use a natural body motion to work your body. Workouts that use natural motions like running, bending, or jumping are much more effective at toning muscles. Sure, the gliding motion of the elliptical burns calories, but that’s about it. It is also easy to slack off on the elliptical. With the treadmill you at least have to keep up with the pace you set. On the elliptical you start off with guns blazing, and 10 minutes later you are crawling along like a turtle. You are much better off doing a 20-minute cross training circuit (burpees, jumping rope, jumping squats, etc.) than 45 minutes of slogging along on the elliptical. If you are looking for another low impact exercise, try the rowing machine. This will get your heart rate up, and also work your upper body and back. 2) Working out for long periods of time at a moderate pace. When it comes to working out, slow and steady does NOT win the race. Maximize your time, people! Instead of working out for an hour at an easy-to-moderate intensity level, step it up a notch. Challenge yourself to 30 minutes of nonstop, intense exercise. You can take 15- to 30-second breaks, but move quickly from one workout to the next. Give it 100% for 30 minutes, instead of 75% for an hour. Need ideas for shorter, high intensity workouts? Check out 15 Minutes to Change Fat to Muscle. 3) Lollygagging. You know that girl at the gym who’s always fixing her hair in the mirror? Don’t be her. Come to the gym with a time frame and a plan. This means no wandering around, no texting your boyfriend in between reps. Come with a set workout to complete, limiting your water breaks to specific points in your circuit for a designated amount of seconds. If this means writing down your regimen, great! Tattoo it to your arm! Whatever! Make the most of your time. Get in, get out. No one likes a gym rat. 4) Too much cardio. Too little strength training. But cardio burns more calories, right? Not so fast, lady. Sure, an hour on the treadmill gives you that instant satisfaction of burning 400 calories. Or so that little blinking screen says. A quick strength training or cross training session, however, will get your heart rate up, burn calories, and develop your lean muscle mass. Building muscle means that those muscles are able to work throughout the day burning more calories when you aren’t working out. 5) Hydrating with sports drinks. Sports drinks may give you a boost, but are full of sugar and calories. During any given daily workout, hydrating with plain ol’ water should do the trick just fine. If you feel tired during your workout, try fueling before. Eating a healthy snack 45 minutes before your workout can give you more energy, and allow you to skip the Gatorade. Try some almond butter on toast. 6) Doing the same exercises over and over again. When you do the same workout routine over and over, your body gets used to it and it becomes easier. The Stairmaster might have been challenging at one point, but pretty soon your muscles become familiar with that motion. Your body only uses half the energy to complete this task that at one point had you huffing and puffing your way to the locker room. Mix it up. By changing your workouts daily you will trick your body into working harder and burning more calories. It will also save you from boredom! Take that new kickboxing class or try one of my workouts! 7) Going it alone. Working out alone can be great. It gives you time to clear your mind, listen to music, and feel the burn. However, sometimes it takes a workout buddy to hold you accountable. Working out with a partner not only makes it more likely that you’ll work out, it makes most people try harder than they would on their own. Your partner can cheer you on to finish that last half mile or to finish those last four deadlifts. And let’s not forget the power of good old-fashioned competition. If your friend is doing 50 lunges, don’t you suddenly feel inspired to do 51? Now that you've dropped those pesky habits, try a new workout: 4 Fitness Trends You Need to Know About.